An ARS-led research team has used radio frequency heating as the basis for a better, faster way to pasteurize raw, in-the-shell eggs without hurting important qualities. Click the image for more information about it. The pasteurization procedure targets Salmonella. That's because an estimated one out of every 20,000 chicken eggs produced in the United States has a high risk of being contaminated with Salmonella, notably S. enteritidis. That pathogen has been associated with eating raw or undercooked eggs, and can cause diarrhea, stomach cramps, fever, and—in some instances—death. 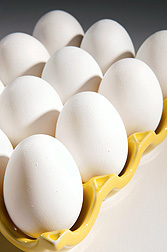 USDA chemical engineer David J. Geveke and his colleagues have shown that their pasteurization process, currently in the prototype stage, killed 99.999 percent of the Salmonella that they injected into raw in-shell eggs for their laboratory tests. The procedure that Geveke's team developed begins with positioning each raw egg between two electrodes that send radio waves back and forth through it. While that is happening, the egg is slowly rotated, and is sprayed with water, to offset some of the heat created by the radio waves. Unlike conventional heating, the radio-frequency (RF) heating warms the egg from the inside out. That's critical to the success of the process. It enables the dense, heat-tolerant yolk at the center of the egg to receive more heat than the delicate, heat-sensitive egg white. The idea of using RF heating to kill pathogens in foods isn't new. But using RF heating to kill pathogens in eggs apparently is novel. Geveke and his colleagues are evidently the first to pair RF heating with a hot-water bath to pasteurize raw, in-shell eggs. Geveke works at the USDA Agricultural Research Service (ARS) Eastern Regional Research Center in Wyndmoor, Pa. He collaborated on the research with ARS chemical engineering technician Andrew B.W. Bigley, Jr. at Wyndmoor, and with Christopher D. Brunkhorst of the Princeton Plasma Physics Laboratory in Plainsboro, N.J.
ARS, the USDA's chief intramural scientific research agency, is seeking a patent for the RF-based pasteurization process. The pasteurization studies, highlighted in the March 2014 issue of Agricultural Research magazine, support the USDA priority of improving food safety.